Just in case you weren’t aware, genetically modified sugar beets are in just about every food imaginable. You’ll find it listed as ‘sucrose’ (among other sneaky labels) in thousands of foods at your local grocery store. The national sugar beet industry (which switched to GMO seeds when the federal government warned that if it didn’t it would face a sugar shortage) and its GM sugar beet crops have already contaminated nearby organic fields. 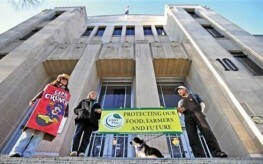 A new ballot measure in southern Oregon has the sugar beet industry in a tizzy because it would ban the use of genetically modified organisms in Jackson County. Financial disclosure reports have revealed that the Southern Minnesota Beet Sugar Cooperative (SMBSC) – a group of three major Minnesota-based processors of the frankenfood that make sure candy bars and other foods stay sickeningly sweet – manufacture with their genetically altered beets. Jackson County residents don’t want genetically altered anything, so the SMBSC, along with the American Crystal Sugar Co. and the Sidney Sugars Farm are doing their damnedest to make sure that Measure 15-119 on the upcoming May ballot is denied. “New financial disclosure reports show that three major Minnesota-based sugar-beet processors — which are major suppliers to food and candy manufacturers — have ponied up major contributions to the opposition campaign. Supporters of the labeling bill do not have records of monies raised, although this could be for one of two reasons – they simply have none, or contributions have not yet been reported. The GMO debate rages onward, and often is only defeated with small margins in voting due to illegal and above-board contributions by GMO-interests. Genetically modified ingredients were narrowly defeated in California in 2012 and Washington in 2013, and the debate may show up again in a possible a measure headed to the Oregon ballot in 2014. The Jackson County Farm Bureau opposes the measure, commenting that it would be hard to regulate such a ban at the county level and that ‘there is no evidence that GMO foods carry health risks.’ It looks like money can push propaganda quite far. Perhaps the Jackson County Farm Bureau should read this article, proving GMOs are killing our children. You can contact Jackson County officials, even if you don’t reside in Oregon, after all GMO is a national issue that we all must step up to prevent from spreading any more than it already has. What’s the chemical difference between GMO-produced sucrose and non-GMO-produced sucrose? I patiently away your answer. How is “sucrose” sneaky? It’s a very specific chemical compound.